The Winter Classic tickets look absolutely gorgeous. Christmas is coming early for Flyers fans, who are finding very special envelopes from Santa Claus… eeerr the Flyers. 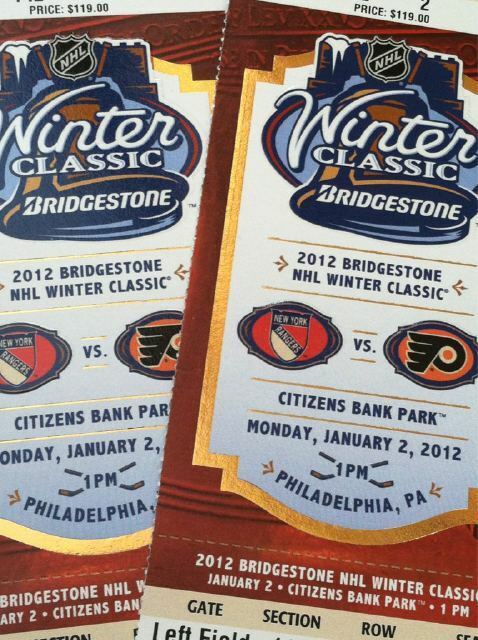 Tickets are slowly arriving to those fortunate (and with fatter wallets) to attend the 2012 Bridgestone Winter Classic held at Citizens Bank Park on January 2. In the coming month, this site will turn into a mini hockey blog to lead into the Winter Classic, a certainly special event that’s going to bring out the hockey fan in a lot of people. As one of the most influential franchises in the NHL, Philadelphia is going to help expose the NHL to the rest of the country in a very positive way. Rangers versus Flyers: it’s NHL hockey at it’s finest.